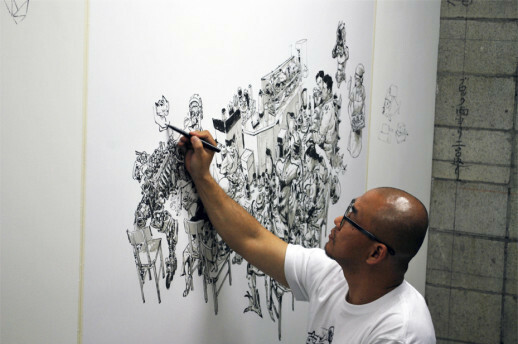 Even though he prefers to call himself a cartoonist, JungGi Kim (pronounced ‘John-gi’ with a hard g) is probably best described as an artistic savant. Kim’s most notable creative asset is his memory, something he has developed over a number of years in a way almost no other living artist has been able to. His ability to render extremely complicated scenes near-perfectly from memory, without the aid of references, has stretched the boundaries of what many artists believed was possible. Kim’s comic books and sketchbook series have garnered him significant acclaim, but it’s his phenomenal live painting events that have taken him around the world. In recent years he has accepted invitations to perform in France, America, all around Asia and now in Japan for his first show simply titled “Drawing Exhibition”. The fact that Kim has to make an effort to memorize things on a daily basis, combined with the fact that almost all experts have debunked the notion of an eidetic memory in adults, means that the answer has to be “no.” The issue is complicated somewhat as there is no term for photographic memory in Korean. Kim completed his second live drawing in front of another large crowd on Sunday. 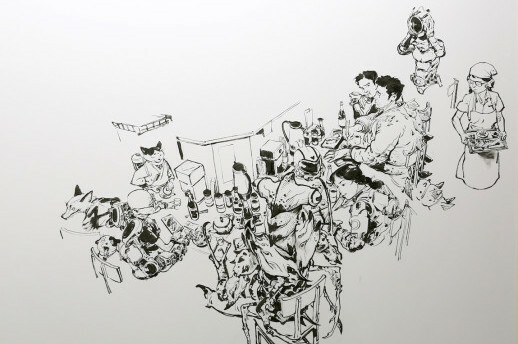 This time he arranged a group of cyborgs, sushi chefs, samurai cats, kaijū (monsters) and more into a crowded restaurant scene in another 3 hour session. I’ve witnessed numerous live painting events in Japan of varying quality over the years. This experience was completely different. Watching the ideas fall, fully formed out of his head onto the paper without any need to map anything out or retrace his steps was a wonder to behold. Not a single stroke was wasted. And each part of the the picture was pieced together as if it already existed. Kim tried to reassure the audience during a Q and A session that the piece had plenty of mistakes. Despite his relative proximity to Tokyo, Kim is still yet to cross paths with one of his biggest Japanese influences, Akira creator Katsuhiro Otomo. With all these trips around the world Kim has become a little distracted from his latest collaboration, the French comic book Spy Games. “The first part has been released, and more than ten parts will be published in total,” Kim stated. “This will become my longest project. So I should be doing this work now, but I’m not. That’s a problem,” he laughed. While Kim goes back to work on Spy Games, his exhibition continues at the one room gallery Hidari Zingaro until the 26th of May. 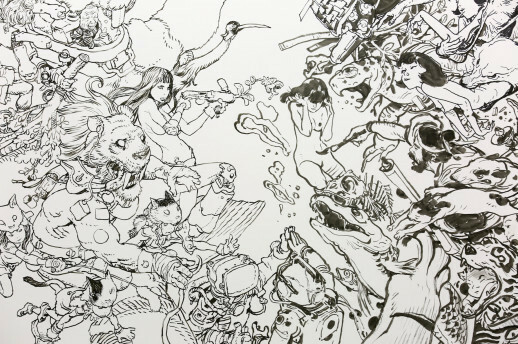 Around a hundred of JungGi Kim’s works are on display, including highlights from his sketchbooks and his comic books.